I don’t know about you but this week definitely felt like the Christmas season is upon us. Scanning the various blogs and article sites that we look through this past week marked the most talked about week I have ever seen for online product search. As such, much of this weeks review will reflect much of the news we have heard about this holiday season. Before we get to that however here are some of the items we want to make sure you are updated on in the TechWyse world. Have You Seen Our Latest Pictures? 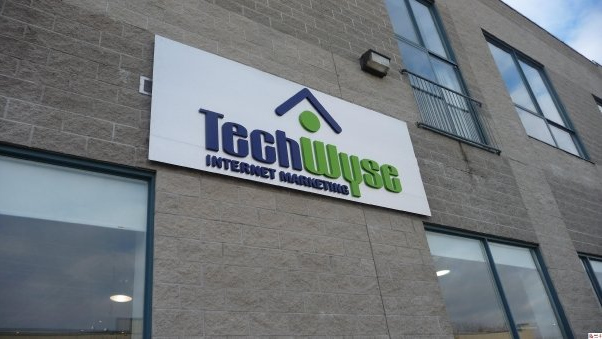 In case you haven’t noticed TechWyse has been getting social! 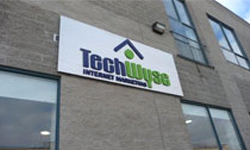 Last week we posted some updated pictures of the TechWyse headquarters located in Toronto, Canada. You can have a look at our latest pictures on Facebook and while your at it make sure that you become a fan to receive ongoing updates! If you are using Twitter you can also get updates by following us! TechWyse Redesign in Full Swing! With the enormous volume of website development work that we do it is often easy to forget to maintain your own backyard. Our team has been working very hard on a new TechWyse design to reflect vast growth we have been experiencing in the industry. 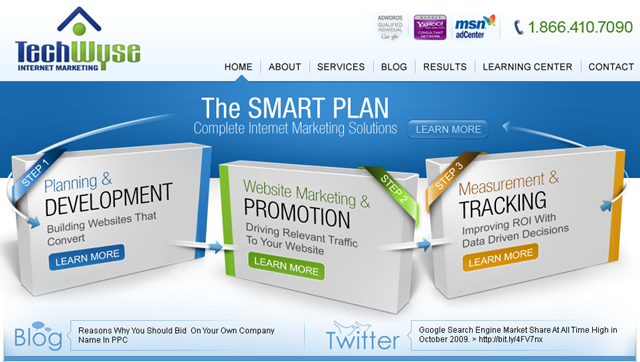 We are hoping to launch our new website in January to reflect the evolving internet marketing industry. But here is a sneak peak for you to check out in the interim. You can bet we will be doing plenty of experiments using Google Website Optimizer to help us understand what works best! 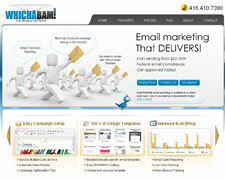 Reminding You About Our Email Marketing Service Aptly Named WHICHABAM! We have been receiving a great deal of positive feedback about our email marketing service. While we have been using it for more than a year now, the email marketing service has now been available to our clients for over 4 months. With advanced metrics which show you things like open rates, what people are clicking on and a host of other items we can’t think of a better way for you to keep your list of interested members updated. As mentioned earlier, the Christmas buzz has begun in the internet marketing world. Here are some of the things that caught our eye in the past week. While much of this information is ecommerce related much of this information can also be used for ‘lead generation’ clients as well. Further evidence that we are in full recovery mode. Black Friday saw $595 Million in online spend this year. 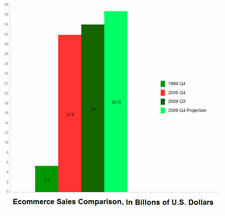 In this chart of the week, we can also see that ecommerce sales in the US is expected to climb from $31.9 Billion dollars in 2008 – Q4 to $36.72 Billion dollars in Q4 2009. Are you making the most of your online opportunities? There is a big slice of the pie to be had in the online world. We urge you to make the most of your opportunities. Our TechWyse analysts are currently offering complimentary service audits to ensure you are being as effective as you can be online. For further info make sure you contact us. 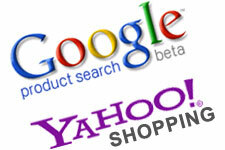 In separate blogs both Google and Yahoo! 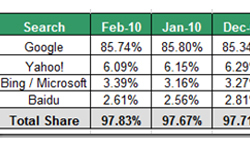 made mentions of product search and online shopping on their official blogs last month. Google announced upgraded search for product and has shown a definite indication that they will be making a large push into comparison shopping and the overall product market. Yahoo! also offered some very good tips for capitalizing on the Holiday season on their own search marketing blog. The Google Adwords team continues to deliver on its promise to deliver meaningful advertising to related content. Take a sneak peak and see some of the newest innovations which are ensuring your paid search ads are being seen by relevant eyes. 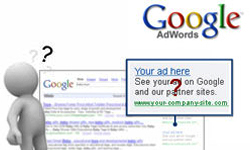 Google announced further alterations to the way ads appear today in a term they are coining as ‘Cyber Monday’. We have been underlining the importance of ‘split’ and ‘A/B’ testing now for many months. Here is yet another compelling video offering a you a glimpse into the importance of experimenting with your core website message. If you are not on board with doing tests as of yet because you feel this is work you cannot take on then let us do it for you. We offer our client base advice on how to improve conversion because (quite simply) this is what we are in business to do. We have a process which will help you dramatically improve conversion and all you need to do to get this process going is to call us. Sales Funnel looks great for the new TechWyse design. It rightly points out the steps for a successful business development. Moreover i’d like to have coffee and watch the big TV placed on walls from the new TechWyse office. Well built office, spacious and nicely done interiors. It’s definitely has the look of a big corporate office. New design looks fantastic, neat and elegant. Overall that gives a corporate functional look. I like the tablets form very much, a different look, it speaks out the very purpose. Internet Marketing	It's 7:00pm! Where Are My Google Ads?! ?